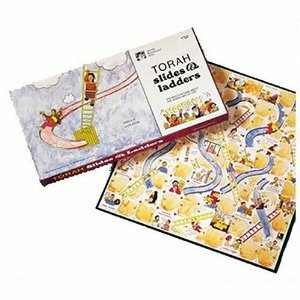 Expert Review of Torah Slides and Ladders Board Game by Jewish Educational Toys, one of our picks of the top Jewish books for kids! A Jewish themed version of Chutes and Ladders. Subjected to the randomness of the die, players bop up and down the board, getting classically conditioned in the Jewish way of life. Land on "Loving your fellow Jew"? Take a ride to the top of the board. Aw, you hit "Making noise in shul"? Slide to the bottom of the pile, and no matzo for you! For 2-4 players, officially up to age 12, but we think up to about age 9 would be a better target. Goldy Says: "Play Chutes and Ladders — just learn all about the mitzvot you can do!"